With a Skagen men's watch you show yourself casual. The fishing town of Skagen lies on a narrow headland in the very north of Denmark, where the North Sea and the Baltic Sea meet. The rough nature there serves as inspiration for the simplicity of the Skagen watches for men. A special feature of the Danish timepieces is their flat design: some models have a case that is only a few millimetres thin. 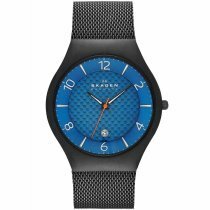 In addition to the Skagen watches for men made of titanium, you will also find particularly elegant models with calfskin straps or watches with additional functions such as a chronograph in our online watch shop. Show yourself casually with a Skagen watch! Whichever watch you choose: Shopping at Timeshop24 is safe, convenient and easy. Of course, each watch is an original product. We send your purchase immediately by DHL - free of charge for you. At home you have 30 days time to convince yourself of your new wristwatch or you make use of the exchange right within this time. Beside others Payment methods we also offer you the purchase on account. We wish you a lot of fun shopping!